Minor crumple on a small part of the bottom border will not show when framed. 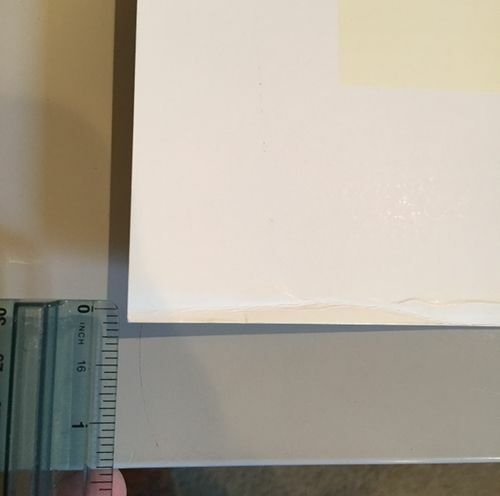 Print border has a 1/4" crumple on the very bottom edge (see image above) which of course will not show once framed. Otherwise, it's pristine. 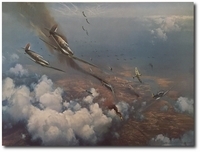 Nicolas Trudgian's highly dramatic painting is the F6F Hellcat of Lt. Alex Vraciu of Fighting Squadron VF-16. With 12 victories already to his credit, Vraciu would add a further 6 to his tally in the space of just 8 minutes on that momentous day. Commander Alex VRACIU U.S.N. - Alex Vraciu first saw combat flying the F6F Hellcat off carriers with VF-6, becoming an Ace in January 1944. Transferring to VF-16 aboard U.S.S. Lexington his tally of victories continued to mount and during the Great Marianas Turkey Shoot he splashed six dive bombers in eight minutes, the following day adding a Zero, bringing his total to 19. His luck ran out in December 1944 when he was shot down strafing an airfield. Bailing out, he spent five weeks with Filipino guerrillas before meeting up with advancing Americans. He ended the war as the U.S. Navy's fourth highest Ace, and retired in 1963. Captain Richard 'Zeke' CORMIER U.S.N. - Richard Cormier served with UC-I aboard the U.S.S. Card in the Atlantic flying both the Wildcat and the Avenger, and was commended for an attack against a German U-boat. In March 1944 he was assigned to VF-80 flying the F6F Hellcat from the U.S.S. Ticonderoga during the campaign against the Philippine Islands, and in strikes against Iwo Jima and Okinawa. With 8 victories to his credit during World War II, 'Zeke' Cormier flew in the Korean War and later as leader of the famous 'Blue Angels'. He retired from the Navy in 1964. Commander Hamilton 'Mac' McWHORTER U.S.N. - Hamilton McWhorter first saw combat with VF-9 flying the F4F Wildcat from the U.S.S. Ranger in strikes against Casablanca. Transferring in March 1943 to the new F6F Hellcat aboard the U.S.S. Essex in the Pacific, he participated in the strikes against Marcus, Wake, Marshall and Gilbert Islands, Rabaul, Truk - where he scored a triple victory in a few minutes, and Saipan. Joining VF-12, he took part in strikes on Tokyo in February 1945, and Iwo Jima and Okinawa. With 12 air victories in 89 combat missions, 'Mac' McWhorter was the first carrier-based pilot to become a F6F double Ace. He retired from the Navy in 1969. Captain Armistead 'Chick' SMITH U.S.N. 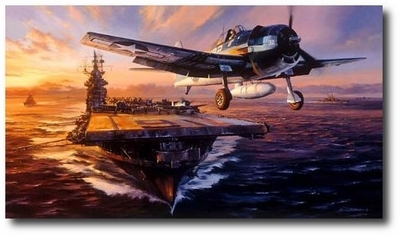 - After the North African invasion of 1942, 'Chick' Smith transferred with VF-9 to the Pacific in 1943 flying Hellcats from U.S.S. Essex. He participated in the carrier strikes against Wake, Marcus, the invasions of Tarawa and the Marshalls; and in the first carrier attacks against Truk and Saipan/Tinian. Becoming an Ace in 1944 he transferred to VBF-12 flying F6Fs in strikes against Tokyo, and the invasion of Iwo Jima and Okinawa. In 87 combat missions he recorded 11 victories. 'Chick' Smith retired in 1972.